Eating organic need not break your family budget. In fact, it is possible to eat wholesome, healthy and delicious every day without spending more than what you can afford. The movement to eat organic started when we realized what the multinational food companies were putting into the groceries we buy. GMOs (genetically modified organism), trans-fats, artificial dyes, hormones, pesticides, chemicals and antibiotics are few of the things that are routinely found in food products that we purchase from stores. Organic foods are made using natural methods. No synthetic fertilizers or pesticides are used in farming. Non-GMO seeds are used and all natural farmyard or green manures are used to nourish plants. Livestock feed does not contain animal by-products, antibiotics, genetically engineered grains or pesticide-sprayed grass. Organic meat is hormone-free and fully free-range. But the biggest impediment to adopting an organic diet is the cost. Organic farming methods and raising livestock organically are very expensive. But if you plan well it is possible to eat a nutritious organic diet without burning a hole in your pocket. Making up your mind at the expensive organic aisle of supermarkets is not easy. You will find it hard to decide on what you should buy and whimsical buys can make you go well over your budget. Meal plans are a great option to cut down grocery shopping bills, reduce wastage and make cooking easy on weekday nights. Also, look out for online offers, coupons and freebies from your favorite companies to not miss out on great bargains. Once you have chalked up the meal plan for a week, make a list of groceries you want to shop. If you are getting started with organic lifestyle, then you may find the prices of most organic foods like meat, fish and veggies very high. If you cannot fit them into your budget prioritize your buys. Non-organic meats, dairy and products made from high-risk GMO crops like soya carry a lot of harmful substances in them. So prioritize your shopping to buy only the organic variety of these food groups, because they contain the highest concentration of contaminants and buying organic will give you the maximum benefits. Knowing to read labels on what you buy is very important. This is because terms like ‘100% organic’, ‘organic’, or ‘containing organic ingredients’ can confuse you and make it difficult to make appropriate choices. If you know to read labels you will be able to make more informed decisions regarding your purchase. ‘100% Organic’ means that the product contains only organic ingredients. ‘Made with Organic Ingredients’ means that 70% of the ingredients are organic and the rest of the ingredients are also closely monitored with the use of GMOs prohibited. ‘Organic’ products are made with 95% organic ingredients allowing leniency in the rest of the components. ‘Organic’ milk is obtained from grass-fed cows that are allowed to graze for at least 120 days. Antibiotics, hormones and animal by-product feeds are not fed or administered to the animals. Organic milk is free of many harmful constituents present in non-organic varieties. Stay informed and educated about the various labeling options for meat and poultry. If you know to read labels you will not be scammed into spending more on a product that is not much better than the GMO-laden alternative. Growing your veggies and herbs is the way to go if you want to get the best and 100% organic produce for your kitchen. Munching on fresh and crunchy beets, carrots and tomatoes grown in your yard or balcony can be rewarding and immensely satisfying. For those of us living in space-starved city apartments, growing our own veggies and herbs may seem like a distant dream. But take heart from the fact that you can easily grow herbs and veggies like lettuce, radish and beets in containers or windowsill boxes. Go online and you will get a ton of ideas to grow an organic garden in limited space. Do not aim big if you are a new gardener just getting started. You will not be able to meet all your organic veggie needs, but a well-looked after garden patch can help you save plenty of money. Herbs are the easiest to grow and take up very little space. They also grow fast and in abundance. You know that organic herbs are very expensive in supermarkets and you often have to buy more than what you need and then think of ways to finish them before they go bad. For a few dollars worth of seeds you get to have fresh herbs the year round. Keep in mind that making a start is most important .As you learn and grow as a gardener you will be able to increase your output and become more efficient. Seasonal veggies and fruits are cheaper than those that are not seasonal. Exotic varieties of veggies and fruits are more expensive than their local counterparts. 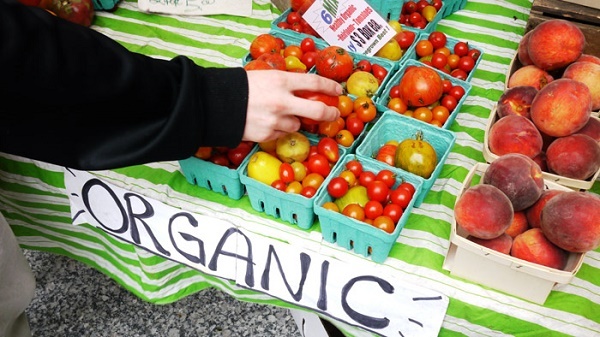 Buy organic veggies that are in season, abundantly available and part of local cuisine. Since they are easier to grow retailers do not charge a bomb for them. Local produce is not shipped over long distances and do not require advanced storage facilities. This means they have lower price points than the foreign varieties. Local fruits and veggies are also healthier because there is no nutrient-loss due to transportation. Buy non-perishable items in bulk. Organic pulses, cereals, grains, nuts and spices are much cheaper when you buy them in bulk. Branded and packaged varieties of that you buy from supermarkets will be considerably more costly than the same stuff you buy from wholesalers. For bulk buying to be really time and money saving, ensure you do your research and find out wholesale stores where you will be able to get the best price in your area. Understanding your unique requirements, prioritizing health above everything else, getting educated on food labels and diligent planning are necessary to ensure that you can stick to an organic diet. Smart shopping and efficient meal planning will help you eat healthy without breaking the bank. So now you know that with grit and determination you can definitely put the healthiest food on the table for your family.